Everyone knows about tile grouting, but in the language of foundation repair and soil remediation, grouting is a process by which various chemical or cementitious mixtures are pumped into the ground. Grouting may be used for filling voids, soil consolidation, water control, and soil compaction. Each type of grouting has a specific purpose as well as various pros and cons. Our engineers will help you decide upon the right approach for your application. Contact us today for a Free Estimate on chemical grouting, slurry grouting, and soil stabilization in Tampa, Orlando, Saint Petersburg, Bradenton, Lakeland, Sarasota, Ocala, Kissimmee, Daytona Beach, Clearwater, Largo, Melbourne, New Port Richey, Port Saint Lucie, Vero Beach, Fort Pierce, Spring Hill and the surrounding Florida area. Rain is a good thing. It washes away dust and pollen and nourishes all growing things. Just beneath the surface, however, it may cause problems. As water washes through joints and cracks in sidewalks, patios, pool decks, and driveways, it may carry fine soil particles away with it. 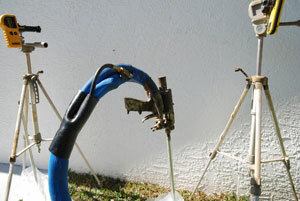 Leaks or breaks in underground drain pipes may do the same thing. The erosion may go unseen for years, but once it's severe enough, structures that initially had solid support begin to sink, crack, and sometimes fall! To stabilize erosion-prone soil and to improve its load-bearing capacities, two different types of chemical grouts are injected into the ground. The first is a two-part polyurethane resin that expands after it's applied to compact the underlying soil. The second is a single component polyurethane resin that permeates the soil and reacts with soil moisture also flowing and expanding to strengthen the treated areas. In fact, chemical grouting turns loose, weak soil into a solid, sandstone-like mass. The benefits of chemical grouting include waterproofing (it stops further water flow through the soil), light weight (it doesn't add to the soil's load-bearing burden) and ease of application (it can be injected into the soil from the surface with small ¼-in. to 5/8-in. diameter pipes). Chemical grouting may also be used to solidify loose fill and soils that were inadequately compacted prior to construction. In addition, they may be used to solidify soils prior to boring or excavation. In many cases, chemical grouting is used to re-level concrete flatwork that has settled unevenly. Polyurethane Chemical Grouting is used to improve soil capacities and strengths. It can be completed using two different types of urethane resins. The first is a two part resin that expands to compact the underlying soil. The second is a single component resin to strengthen the underlying soil. Smaller diameter injection pipes are used, which help make the completion time quicker. Lay out locations for injection pipes. Install ¼” – 5/8” diameter injection pipes approve depths. Inject the proper amount of resin to improve the underlying soils. Maintain a clean worksite during each day of the project. Slurry grouting is done using a cementitious grout. This grouting technique is often used to fill voids discovered below a slab or foundation. It may also be used to fill voids created when a slab has been releveled using steel piers. The grout, a loose cement mix, may be supplied by ready-mix trucks or mixed on site. Small perimeter holes are bored into the affected concrete slab and the grout is pumped below the slab to fill the voids. Once the grout has set up, the holes are filled and troweled smooth with patching cement. Slurry grouting may also be used to inject a highly liquid grout into shallow, loose soils under various types of structures. The liquid mix actually permeates the soil and causes its particles to bind together, making the soil more stable. To inject the slurry, steel injection pipes, called rods, are driven to depths of 10 to 15 ft. at prescribed intervals around the building perimeter. Then grout is pumped into the soil under low pressure, while the building is monitored for movement. 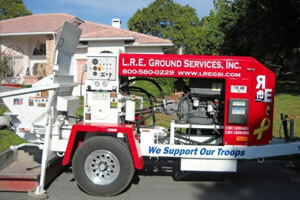 Slurry Grouting is used to fill voids below a slab or foundation. When a void or gap below a floor slab or foundation is present, there can be stress to these areas that can cause damage and/or displacement. Core small perimeter holes into the concrete slab. Pump a loose grout mixture below the slab to fill the voids. Once the grout has set up, smooth out the holes with cement. Clean up the work site.